Arithmetic Logic Unit) it is a part of the execution unit, a core component of all CPUs. ALUs are capable of calculating the results of a wide variety of basic arithmetical computations. CPU (CPU Frequency) speed or frequency in processing for a second, for CPU has the unit is MHz, for example, 600 MHz shows CPU has ability of processing 600 million per a second. Next, we're going to talk about System Bus or Front Side Bus (FSB) is a term for the physical bi-directional data bus that carries all electronic signal information between the central processing unit (CPU) and other devices within the system. CPU core voltageis the power supply voltage supplied to the CPU. It is section we know about the amount of power a CPU uses, and thus the amount of heat it dissipates. L-1 Cacheis installed in CPU, can be called Cache-On-die. L-2 Cache Cache is located on mainboard. Apparently, it is a long IC that has just two rows of legs in a straight line like a comb. Some piece is square chip in which the pins are arranged in concentric squares. It resides on the side nearly RAM socket. CPU is divided into 2 types. 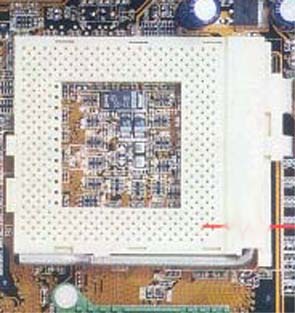 This CPU sockets and processors in use today are built in a ceramic slab, a square array of metal pins. The pins can then be inserted into the holes in a printed circuit board and soldered in place. Slot-CPU has are rectangle chip with the black plastic. There is CPU on the center. For its side, is resided others devices. This type of CPU has high capital money, so it can't be produced next. CPU of Intel includes some of Pentium Celeron, Pentium II, and Pentium III. There are many different types of CPU socket and slot, if CPU is installed into Main board, main board will connect into connector linking the motherboard to the CPU. Ok, this part is end here, see you next part. Good bye! !